Use the power of your Certified Master Inspector® professional designation to boost your inspection business. Scroll down. Scroll down and follow these steps to use the power of your Certified Master Inspector® professional designation to boost your inspection business. Click to find yourself on the CMI® website. Click to find yourself on the CMI®website and locate your name. Make sure that your contact information (phone, email, website) is correct. If you need to have anything corrected, email [email protected]. Click to learn how to download your CMI® certificate. Order your high-quality Certified Master Inspector® vehicle decal set (four large and two small decals) and put them on your inspection vehicle. Your CMI® decal set is free. Visit http://www.inspectoroutlet.com/cmi-decals.aspx. Click to order inspection vehicle decals. Click here to order inspection vehicle magnets. Most consumers visiting your website are looking for one thing. They are looking for a good inspector. The instant they believe they’ve found what they’re looking for, they stop looking and schedule the inspection. The Certified Master Inspector® logo immediately causes the consumer to believe that you are the perfect inspector for their project. So, add the CMI® logo prominently to your homepage and every other page of your inspection business website. Go to https://certifiedmasterinspector.org/my/dashboard/logos to download the CMI® logo. Click for instructions to add to your website. Never miss scheduling an inspection again. On a roof? No problem. Asleep at 3 a.m.? No problem. We’ve built an automated assistant who works 24 hours a day for you. Simply install this button on your inspection business website and your automated assistant will alert you when a consumer needs an inspection. Visit https://certifiedmasterinspector.org/call-me for instructions on how to add the “CALL ME” button to your website. This is a free service for all Certified Master Inspectors® who are also members of InterNACHI®. Click for instructions to add your website. Consumers and real estate professionals often ask the Master Inspector Certification Board to verify that an inspector is a Certified Master Inspector®. You can add a custom webseal to your website that allows visitors to verify this for themselves. Go to https://certifiedmasterinspector.org/webseal for instructions to add the webseal to your website. Click the logo for instructions. To attract first-time home buyers, put the “First-Time Home Buyer-Friendly” logo (with optional suggested text) on your website. Go to https://certifiedmasterinspector.org/friendly or instructions. Click to play the Joe Theismann promo video #1. Click to play the Joe Theismann promo video #2. Click to play the Joe Theismann promo video #3. Click to play the Joe Theismann promo video #4. Click to see examples in use. There are several ways to to tout your CMI® professional designation. Do so on your inspection business website and brochures. Go to https://certifiedmasterinspector.org/examples-of-professional-designation-in-use to see some examples of the many permitted uses of the trademarked professional designation. Click to order your CMI® pin. Order a free Certified Master Inspector® gold-plated pin and wear it during your inspections and whenever you meet someone who might be in a position to refer business to you. Your CMI® pin is free. Visit https://www.certifiedmasterinspector.org/pin. Click to order yourCMI® gold ring. Click to order a protection throw rug. Click to create your custom “The Safe Home” book. Every CMI® has their own custom book titled “The Safe Home.” To create and download yours, simply locate yourself on certifiedmasterinspector.org/members Then, click the Download “Safe Home” Book link. Wait three minutes. The system will create an entire book that has your name and contact information on the cover and embedded throughout. Offer your inspection business website visitors a free copy of your customized “The Safe Home” book. To get the URL (web address) of YOUR own custom book, go to the CMI® site at certifiedmasterinspector.org/members, locate your name, and right-click on the Download “Safe Home” Book link to get the URL to your specific book that has your name and contact information embedded throughout. You can then link to it from your website as a free download. And don’t forget to email your favorite real estate agents and former clients the link to your custom book. Go to the Master Inspector Certification Board’s Code of Ethics page at https://certifiedmasterinspector.org/code-of-ethics. Make a clean copy of it. If you don’t know how, go here for instructions: https://certifiedmasterinspector.org/how-to-make-a-clean-copy-of-a-document. Put it on a page on your inspection business website. The CMI® Code of Ethics used the phrase “Certified Master Inspector®” more than 20 times. This will improve your search rank when a consumer looks for a Certified Master Inspector® online. Click to get to the InterNACHI message board. InterNACHI’s message board (forum) comes up often when consumers search for inspectors and inspection-related information (see traffic stats). You should use your message board posts as mini-ads to promote your inspection business. The easiest way for Certified Master Inspectors® to do this is to display the Certified Master Inspector® logo next to their name and/or in their signature on every message board post. Those three little words — CERTIFIED MASTER INSPECTOR® — say it all…. and say it quickly. For instructions to add the CMI® avatar next to your message board name, go to the top of this page: https://certifiedmasterinspector.org/message-board-marketing Alternatively, visit our visual instructions page: https://certifiedmasterinspector.org/internachi-signature. All of your previous posts will now have the Certified Master Inspector® logo next to your name for consumers to see. For instructions to add the CMI® logo to your message board signature, scroll halfway down this page: https://certifiedmasterinspector.org/message-board-marketing. Alternatively, visit our visual instructions page: https://certifiedmasterinspector.org/internachi-signature. All of your previous posts will now have the Certified Master Inspector® logo in your message board signature for consumers to see. Click to post on the CMI forum. Visit https://www.nachi.org/forum/f55 on a regular basis and contribute. Every one of your posts helps improve your search-engine optimization. Click to visit the CMI® Facebook page. Facebook is a great way to promote your inspection business. Post on the CMI® Facebook page at http://www.facebook.com/certifiedmasterhomeinspector. Follow the MICB on LinkedIn at https://www.linkedin.com/company/master-inspector-certification-board. Click to download your LinkedIn background image. Add a custom CMI® background to your LinkedIn page. Here is one you can download: https://certifiedmasterinspector.org/linkedin-background/. Click to download your ActiveRain profile background. Add a custom CMI® background to your ActiveRain profile. Here is one you can download: https://certifiedmasterinspector.org/activerain-background. Create a press release announcing that you have been awarded the Certified Master Inspector® professional designation. The press release should be written on company letterhead and sent to prospective clients and real estate agents, and also uploaded to your inspection business website. It’s an effective marketing tool that CMIs® can use to command higher inspection fees. Here is a sample press release that you can use: https://certifiedmasterinspector.org/sample-press-release. If you submit your press release for publication, be sure to follow the formatting and conventions in this example so that the professionals you submit it to will take your announcement seriously and will publish it without delay. Click to order CMI® rack cards. Click to order your blue CMI® cap. Order your free Certified Master Inspector® cap and wear it on your inspections and whenever you meet someone who might be in a position to refer business to you. Your CMI® cap is free. Click to order your CMI® T-shirt. Order your free Certified Master Inspector® t-shirt and wear it on your inspections and whenever you meet someone who might be in a position to refer business to you. Your CMI® t-shirt is free. Visit http://www.inspectoroutlet.com/blue-cmi-shirt.aspx. Click to order a CMI® polo shirt. Click to order CMI® dress shirt. Click to order a CMI® vest. Order your Certified Master Inspector® vest and wear it on inspections and whenever you meet someone who might be in a position to refer business to you. You can order your CMI® vest at http://www.inspectoroutlet.com/cmi-vest.aspx. Click to order your CMI® patches. Order your free sew-on Certified Master Inspector® shirt/jacket patches. Your CMI® patches are free. Visit http://www.inspectoroutlet.com/free-cmi-patches.aspx. Click here to order CMI® shoe covers. Click to order your CMI® Padfolio. Click to order custom brochures. 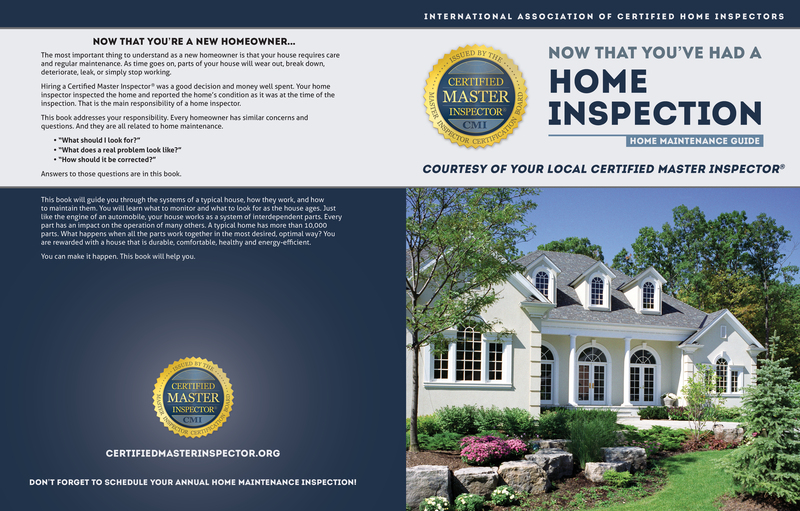 Order a custom brochure with the Certified Master Inspector® logo on the front. If you are an InterNACHI® member, InterNACHI’s Member Marketing Team will design one for you for free. Visit http://marketing.nachi.org/portfolio. Click to order an auto brochure holder. Click to order custom home maintenance books. Order your photo I.D. card. If you are both a member of InterNACHI® and a Certified Master Inspector®, you can get a free Certified Master Inspector® photo ID card. Go here to order yours: https://certifiedmasterinspector.org/id. Click to order your CMI® lanyard. Order your free Certified Master Inspector® lanyard by visiting https://certifiedmasterinspector.org/lanyards. Order your custom maintenance books. Your company can have its own customized Certified Master Inspector® home maintenance book to give to clients. InterNACHI’s Member Marketing Team can put anything you want on the cover, including a different title, a photo of you and your inspectors, your work vehicle, your logo, or whatever you like. Here is a generic image of one: https://certifiedmasterinspector.org/wp-content/uploads/sites/24/2016/09/CMI-cover.jpg. For more information about having your own custom home maintenance book designed, visit https://www.nachi.org/now.htm. It reduces your liability. A dissatisfied client will often describe your services to his/her real estate agent — or, worse, to a judge — much differently than the truth. Procuring and maintaining a copy of this survey will bring them back to earth, so to speak. It is a handy document to have to present to an agent who is complaining and can often end a legal action all by itself. It is the next best thing to a deposition taken at the peak of their satisfaction with you. It alerts you to weaknesses in your service. An unhappy client will often be too shy to complain to you in person about your service — or, worse, complains only to the agent who referred you. Providing this survey offers your client a way to express his/her dissatisfaction while you are still on the inspection site and can do something about it. Client feedback is very useful for improving your services. It reminds your client that you don’t have X-ray vision. It is important to explain to your client that a home inspection can’t reveal every defect that exists (or will ever exist) in their new home. This Survey works in conjunction with your pre-inspection agreement (between you and your client) in that it again reminds them of this fact. It encourages your client to order additional ancillary inspections. Some Certified Master Inspectors® offer additional inspections, such as WDO, and radon, water quality, and mold testing — for additional fees, of course. This Survey reminds your client to ask about the other services you might offer. It lets your client know that you care about his/her opinion. Everyone likes being asked. It helps you get more work. By sending a copy of the flattering Survey back to the agent who referred you, you remind that agent to refer you again. Learn how to use the Client Satisfaction Survey. Ever get a caller who is price shopping? Get them to pay you $150 above and beyond what all your local competitors charge. It’s easy. Read pages 21 through 27 of this free downloadable book: STACKS: A Home Inspector’s Guide to Increasing Gross Revenue (PDF). Click to borrow a CMI® tablecloth. Alternatively, you can purchase a CMI® tablecloth of your own. Click to borrow a CMI® pull-up banner stand. Click to buy the CMI® Highest Professional Designation pull-up banner stand. Click to order your custom Certified Master Inspector plaque. Then, stage the photo shoot. Wear a nice shirt, preferably with your home inspection business logo on it. Perhaps have a fellow inspector, a local politician, or maybe a local real estate agent present you with the award. Make sure they dress up for the photo shoot. You may want the presenter to hand you the award while also shaking your hand. You should both be smiling into the camera. Smile and take the photo. This image conveys two parallel messages at once. The first is that you are a Certified Master Inspector®, which means that you’re the best. And the second is that you’re such a good inspector, you’re getting an award for it. It really is a killer image – concise and powerful! Put this image on the homepage of your inspection business website. A picture is worth a thousand words, and a photo of you being awarded your Certified Master Inspector® professional designation says it all. Hanging it on your office wall is nice, but that won’t generate any sales. This image on your homepage will stop visitors from moving on to check out your competitors’ websites by instantly convincing them that they’ve found the right inspector… you!